A little under two months ago, word reached me that Shelby Gomas – the founder of Feline’s Pride – passed away. I’ve wanted to write something, say something, for the longest time, but I’ve been without words. Shelby hatched the idea of Feline’s Pride a few years back after I ran into him on the Feline IBD Yahoo e-group. He’d seen firsthand how a carefully prepared, correctly served raw meat based diet was the healthiest thing for carnivores and launched his company, selling about the only pre-made raw cat food I ever felt comfortable buying. Shelby “got it” about what was truly appropriate for carnivores, and didn’t fall prey to the common folly that other raw cat food manufacturers did – which was to toss in all kinds of healthy-sounding – but entirely species-inappropriate – ingredients like blueberries and flax seed and potatoes. Don’t get me wrong – I’m happy to see more companies elbowing their way into the business of making healthy, fresh, cat food. But I will always hold out immense respect for those that shy away from adding what amounts to filler – under the anthropomorphic fantasy that what’s very healthy for humans is appropriate for small cats – even though it’s tempting and easy to market such formulas. Shelby was special. He was very funny. He adored his animals. And he saw every cat who ate the food he made as an adoptee. Having been a homemade cat food advocate for a long time, I never felt comfortable serving any food I hadn’t made myself. 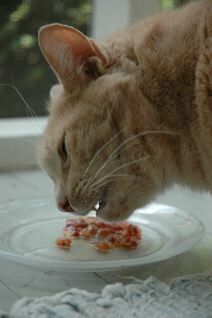 But when Feline’s Pride came along, I started supplementing the food I made with orders from Shelby. Anyone who knows me – and what a fussbudget I am about what goes into my cat’s food and my innate suspicion about anything anyone else prepares – knows that I must have had a very high degree of trust to serve someone else’s food. The cardboard boxes with the food inside almost invariably arrived with special gifts for the cats — homemade catnip toys and sometimes even a personal note of affection for Duke and Nettie. For about a year there, I found myself getting ‘lazy’ and just buying Feline’s Pride. I put my grinder away, and was frankly grateful as life and my job got more busy that I was able to buy and confidently serve cat food that was as good as anything I could make at home. I went back to making my own food all of the time in the middle of 2010, in part because – frankly – I missed doing it. And because after losing Duke earlier in the year, I wanted to return to the labor of love that began because of Duke. It’s staggering to think of how much love-charged water has passed under the bridge since a handful of us first started waking up to the the importance of reexamining the whole paradigm of feeding small cats. The founder and moderator of the Feline IBD e-group, Lee Ellis, started her own pet sitting service, and continues to share the word with her clients about the benefits and wisdom of a healthy diet. One of the godmothers of raw feeding, my first mentor, Michelle Bernard, has taken her knowledge and insight on healthy feeding for cats and become a vigorous advocate for healthy raw diets for her beloved dogs. Natascha Wille of the Raw Meat Cat Food Company (formerly Feline Future) remains, after over 15 years, an articulate and insightful advocate for raw feeding. Then there’s wonderful Margaret Gates, who launched an amazing movement and site with the Feline Nutrition Education Society – and some of the best ‘educational commercials’ online sharing the important message about raw feeding – without ever getting preachy or so weird no one will watch. It’s an amazing site. And Dr. Lisa Pierson – who I am honored to count as a friend – has a recently revamped website on cat care that knocks it out of the ballpark when it comes to one-stop shopping for thoughtful, sound, advice on every aspect of cat health, including nutrition. Then? Then there was Shelby. An upstart if there ever was one. His vision and passion – much more than his business sense (I’m guessing) – were what kept him going, but bless him for that. He always put cats first. And talk about someone with a heart always in the right place. Thank you, Shelby, for making such a difference when you were here. Thank you for all the meals that my cats enjoyed because you made them when I was too busy. Thank you for sharing your deep passion and love for our animal companions. If I had a hat on just now, I’d “doff it” to you. And there are many cats thriving and well today because of your dedication. For all that, we are ever grateful. Duke, the magnificent cat-beast who jump started my passion about feline nutrition, turned 14 years old this month. He’s eaten nothing but grain-free, vegetable-free raw food for a full eight years now. (Well, okay, he’s stolen some cooked chicken off our plates now and again.) His blooming good health is, to my mind, testimony to the ‘miracles’ that can happen when a carnivore eats like a carnivore. The first six years of his life were, for him, a struggle with cramping, diarrhea, and all of the misery that comes from inflammatory bowel disease. His story is discussed in more detail on my website, so I won’t belabor the details here. I’ll only say that seeing that happy, healthy, and energetic boy-cat running around our house and demanding and eating his meals with enthusiasm and gusto fills me with gratitude that I caught on when I did to feeding cats properly. I get a lot of emails from people worried about taking the first steps toward raw feeding. I remember that same feeling of trepidation: “What am I doing? Am I going to kill my cat here?” Although I was lucky to have a handful of raw feeding mentors in my corner, it still felt like a risky proposition: to feed my beloved, already sick cat something that didn’t have a reassuring label indicating “nutritional completeness” on it. Time, and results, shifted everything. My biggest concern now is running out of raw cat food and having to serve something that someone I don’t know has prepared. It’s been years since I’ve visited a pet supply store except to stock up on cat litter. And cringe as I walk by aisles of dry food. And speaking of that, I made a recent, wonderful excursion with a friend to a local holistic pet supply store. It’s called Pet Sage. I’ve heard great things about this store for years, but since I’ve generally had little need for visiting places like that, I postponed a visit. Besides, I know myself, and I know how cranky I get walking around stores and seeing all kinds of ridiculous things for sale. I was, however, intrigued about a visit there given that the store had, courageously, opted to stop offering many of the dry foods it previously sold. That’s huge! Honestly, my heart swelled to the size of South Dakota hearing that. And you should see the selection of amazing, truly healthy cat (and dog) foods they sell. What a relief to be able to walk into a store and see fresh food for cats and dogs in freezers rather than aisle after aisle of species-inappropriate meat-flavored cereal. I left a retail store, for the first time in eight years, buying some food for my own cats. I picked up some Bravo ground rabbit and used it to make up a batch of food at home. To my surprise, since my cats have been distinctly disinterested in rabbit for some time, they dug in. And eight paws up to Pet Sage. May you be the leading edge of a new trend. It gets a little easy sometimes to feel like those of us who have been preaching from our bully pulpits all these years on the dangers of dry food as a staple of a cat’s diet can finally kick back and relax and shut up for awhile. 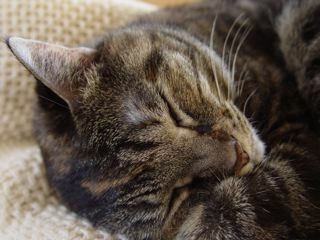 I’d like to think that with all the overwhelming evidence, including in mainstream veterinary scientific journals, that dry food exacerbates or causes disease in cats, the number of people and vets implying that dry food is still an ‘acceptable’ choice for the long-term health of a cat would dissipate.It’s striking to me that despite all these efforts by so many determined and smart people, it’s still the rule–not the exception–to visit a veterinary clinic and see dry food for sale. It’s like visiting a cardiologist and finding that the doctor is selling bags of “prescription Big Macs With Extra Cheese (sensitive heart formula)” from the waiting room reception area. I cannot get my brain around this one. I realize that the sale of prescription food brings in needed revenue to vet clinics, but really, is there no other way to raise cash in a vet clinic? We cat people are a little crazy, after all: we spend $20 on a $1 feather toy for our cats. How about we get vet clinics to start selling overpriced pet toys to make up for the revenue they’d lose if they gave up selling dry food? Our animals would sure be a lot healthier. I’m not against vets getting paid for what they do. I’m very much in favor of good health care providers earning the living they deserve. It’s hard and very demanding work. But bankrolling financial success by selling products that make animals ill is over the line. And yet that’s what’s happening every day. And when vets sell these products, it sends the message that it must be okay. And soon e-groups around the globe are repeating bad advice. And the cycle continues. After all the years I’ve been running my website on cat nutrition, reading and answering emails, and poring over whatever books or articles I can get my hands on related to cat nutrition, there are times that I sense a definite shift in the “collective consciousness” on the issue. But that sense starts to fade when I visit a veterinary office and still see rows and rows of dry food, or visit some informational websites or online e-groups on cat health and read that there is still ‘debate’ on the possible value of dry food. I get exceptionally discouraged to see well-meaning ‘advisers’ on online egroups, under the guise of staying ‘open-minded,’ implying that dry food is safe for cats. I can’t judge these people too harshly, though, since that view is validated by the very purported expert class–veterinarians–that they understandably look to for guidance. It’s a delicate and tricky position that I’m in–trying as a lay person to inform and educate caregivers on at LEAST why it’s critical to stop feeding an exclusive diet of dry food while sensitively trying to explain that their vet might just possibly be wrong on this aspect of their animal’s health. It’s tricky terrain to navigate. Are there plenty of good reasons why vets might be wrong? Yes, but that doesn’t make them less wrong on the nutrition score. Hundreds if not thousands of communications I’ve seen over the years, through my own website and from years of co-moderating a Yahoo group dedicated to help people with IBD cats leaves me with the very clear impression that the bulk of vets remain strongly resistant to taking a fresh look at the way we’re feeding these obligate carnivores. Cereal-packed dry food makes absolutely no sense as a staple of a diet for carnivores, and while my site has a lot of information about raw feeding (because it’s what I do and what has worked for me), I make it as clear as I can on my page on diabetes, obesity, and FAQs that if people can’t or don’t want to feed raw, then at least feed canned food with as few grains as possible. And the good news is that there are a handful of good companies out there now selling premade raw food that’s well suited to cats. I’m a big believer in a safe, balanced, raw meat based diet for cats, and my site is full of information on how one might proceed with that kind of a diet. Best of all, my site is not the only one out there. I’m in very good company these days with people much smarter than I am who are getting the word out on cat nutrition. I view vets as a powerful potential ally in this David versus Goliath-esque effort to shift the status quo on how we feed our cats. But for that shift to happen means many vets are going to have to start asking questions and seeking out informed and unbiased information on nutrition. The information they need to become savvy guides for their clients is not readily available or conspicuous in veterinary education, near as I can conclude. If it were, then there would be many fewer bags of dry food in vet clinics. The shift also requires demand from the ground up — from the consumers of information those paying for cat food who can encourage, if not demand, sane choices. I understand and am extremely sympathetic to how much harder a vet has it than a human physician–a veterinarian is expected to know how to treat all kinds of species and handle clients who can barely be bothered filling up a gravity feeder with Crappy Meat Flavored Cereal Mix much less pay attention to why canned is better than dry. But the fact is that vets are on the front line: they are the first line of defense against the dominant paradigm that currently implies, “Dry food is fine, it’s nutritionally complete, and it’s a perfectly fine diet for cats.” It may be a lot of work and very overwhelming to make education on nutrition a part of a short veterinary appointment, but being overwhelmed doesn’t justify, in my mind, practicing substandard medicine. Vets are who people turn to first when they’re looking for guidance on how to feed their animals. And it’s exasperating for me and so many others to see that despite the overwhelming data to the contrary about dry food, most vet clinics are still selling and therefore implicitly endorsing dry food. That’s an awfully strong message that’s being sent and, I’d argue, one that harms cats. And I’ll stay politely noisy as long as I need to. Why are vets still peddling junk food? One of the most articulate and professionally credentialed veterinary voices today on the root causes of the latest pet food recall, Dr. Elizabeth Hodgkins, made quite a splash in Canada in June when the California-based veterinarian spoke to a Toronto gathering. Have a listen and a read. Dr. Hodgkins is speaking out a great deal on the folly of putting faith in labels that make claims about foods being 100 percent nutritionally complete, and gaining long overdue attention for the myth that the feeding trials used to determine minimum requirements are meaningful. Did you know, for example, that feeding trials test maybe eight animals–and a couple are allowed to drop out or die–and continue for perhaps between 10 weeks and six months. Can anyone keep a straight face and say that these kinds of tests really tell pet food companies what a food must contain to sustain the long-term health of an animal? And you might pay special attention to her comments about the reason that so many vets are reflexively opposed to raw feeding. And why you may see so many rows and rows of bags of dry food for sale at your vet’s office. Sobering stuff. My vote? Now is the perfect time to speak up and open a dialogue with your own vet about what you feed. As much as I despise what this latest recall has wrought, the silver lining in this cloud is that no vet who’s had his or her head in the sand on diet issues can seriously argue that commercial pet food (including the stuff sold from clinics) is safe and nutritionally complete. Give your vet a copy of the 2002 article by Dr. Debra Zoran. Suggest s/he have a look at Dr. Hodgkins’s awesome new book. Gently ask for an explanation about why so much dry food is sold in the clinic. More and more vets are getting on board and recognizing that abdicating nutritional decisionmaking to the pet food companies doesn’t offer their clients what they deserve and are, increasingly, demanding.